So now that you have the pitches you created yourself or from importing the MIDI file as shown as in the previous step. After you created the pitch, you could clearly see that they’ve filled the lyrics section with a bunch of “a”. So you could play it and hear your VOCALOID says “a” with the pitches (he/she would sound like he/she’s humming the song), and if you’re happy with that, the next step is to enter the lyrics. The Japanese VOCALOID would accept romaji, hiragana or katakana. It will NOT accept kanji. To enter the lyrics, it’s pretty straight forward. Either double click on one of the pitch lines and type it, or right click on any of the pitch lines and select “Enter lyrics…”, and then enter the lyrics into the window that appears. And then you’re done! 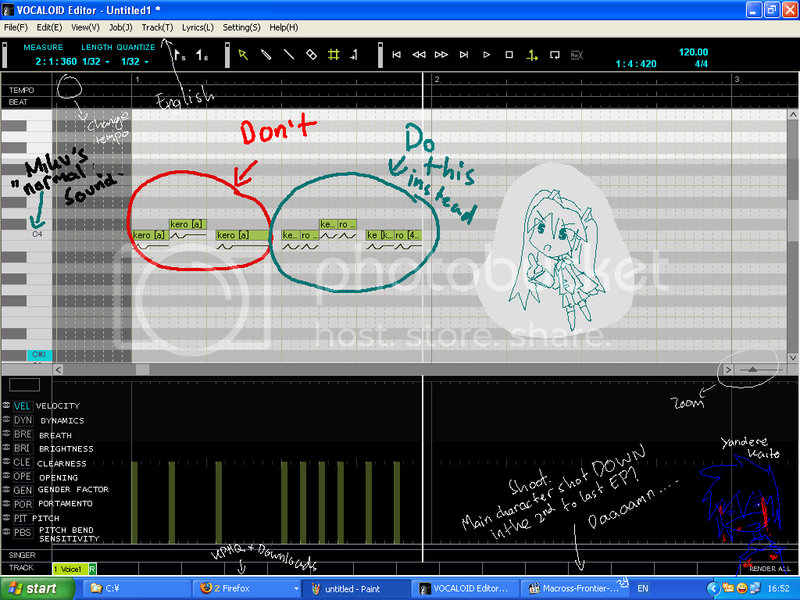 Click play to check if your VOCALOID can sing it properly. Here’s another explanation video from Crypton. Note: If you couldn’t view the video above, be sure that you’ve already installed the Adobe Flash Player. And there you have it! Now your VOCALOID is singing! It’s that easy! Now what’s left is just the tuning part (and maybe make some PV if you’re planning to upload it into a video sharing site such as Nico Nico Douga). And you maybe notice that in the end of the video, the guy changes “Ha” (は) into “Wa” (わ). Well, in a real life situation, even though Watashiha was written as “わたしは”, it’s usually pronounced “Watashiwa”, or “わたしわ”. Keep in mind that your VOCALOID is singing every word you type, he/she doesn’t read it and make necessary changes by its own. Also keep in mind that the “Ha” (は) and “Wa” (わ) case is different with the “He” (へ) and “E” (え) case. If you want to be sure, just sing the song by yourself and type what you hear from your mouth. My explanation just now might be confusing, so here’s an example of what I’m talking about. This is a part of the lyrics from CLANNAD’s opening theme, メグメル　～Cuckool Mix 2007～. Now, so that we could understand it better, let’s romanize it. Well, you (よう) is usually pronounced as a longer version of yo (よ), but your VOCALOID would emphazise the u (う) part. So it’s better to just write yo (よ) in the VOCALOID editor, and then drag the note to show that it’s pronounced a bit longer. Here’s another example of what I’m talking about, still from the same song. Note that this example is only applicable when you input the lyrics in hiragana or katakana. I don’t think you’ll get this problem when typing the lyrics in romaji, but if I’m wrong, please tell me in the comments below. Let’s romanize it again (for reference). Now, the kitto (きっと) part have been read by the VOCALOID editor as kitsuto (きつと). Why? Because usually, the っ indicates a small pause in a normal word, but in the VOCALOID editor, your VOCALOID reads it as a big tsu (つ). So before entering the lyrics, think about those two examples for a while and change your lyrics where suitable for the VOCALOID to sing it. Now, go ahead and make a great song with your VOCALOID! P.S. : The video above was from Crypton Media Blog. If they have been found inappropriate to be placed in this site, I’ll take them down. You may contact me by e-mailing me here. How about putting the small “tsu”? I still having problem to do that. I just got to ask, does User Word Dictionary have anything to do with lyrics? My cousin on another country input some lyrics but still came-out as a’s. I don’t use VOCALOID much since I only like to listen to Miku sing so I can’t really help her. If it does, then would you kindly post tutorial or something about it? Sorry about grammar. I’m Japanese on a vacation with my cousins. Thank you for your concern. Unfortunately I cannot type in Japanese as the computer I am in is from the Pearl of the Orient. Yes, I am taking a vacation in the Philippines with my cousins, so I cannot type in Japanese. My cousins want to know if is possible to use the User Word Dictionary for other uses. Any use is fine. Is under Lyrics I think. Thanks for your concern. At my blog I posted a list of possible syllables that VOCALOID2 recognizes on default. Please tell if there are some mistake on it. I can’t write japanese, or even have the correct font for doing so on this pc. (Is there a correct font? And if so, where?) In that video it turns text into Japanese characters.. Doesn’t do that for me. Basiclly everything I type turns into [a]. I’m trying to work on getting sounds. When I try to import a midi.. It works only sometimes. I get this error alot, not even in english or japanese. Just random squares and symbols. When I do import a midi and it works. Say.. Love Hina’s Sakurasaku on keyboard midi. It pulls up a board with a bunch of checks and audio tracks.. most likely the different tracks in the song. They all have solid square lines and/or other symbols, which dont say anything in any language, and all tracks are named the same. On top of that, when I get past that, all the files seem to want her to sing ALL of the different instrument, and seem to have alot of notes at two pitches at once. Again do I get the error message of symbols telling me something about “Voice1” and how it cant sing two pitches at the same time. When I got the software, I was ecstatic. Turning it into english (changing the single file OR the full transform) doesn’t change the error messages, nor does it stop the program from wanting the g2pa2_JPN.dll file. Giving me yet another error of messages with symbols. I know it takes quite a bit of editing, but honestly I’ve nowhere to begin. These error messages are telling me what to do, but I wish I knew what they said. Where do I begin fixing these plethora of problems? Firstly, to type or to even view Japanese, you’d have to install the Japanese Language Pack. Most likely that you were using Windows XP, and if that’s the case, you’d need the Windows XP CD to install it. In the video, they’re typing Japanese, but you don’t have to, just type in romaji. but still come out as humming. What did I do wrong here? Hi, I think you’re indonesian, so can I use indonesian language instead in my next post? thanks before. please reply ASAP. 1) What kind of fatal error did you get? Are you sure that you’re registering from this link, not from the forum itself? 2) You can’t do that… One note is only for one japanese character… For more information, please check out this image. I got the interface in English but the error messages are in jalsdjfklsdjff. Is there any way to make it English? Hi kevinay Thanks for this tutorial. I was frustrated Miku can only sings aaaa until I read it here that you can only type 1 syllable at a time… Damn I did not know you are Indonesian.. I’m Indonesian too :). I’ll keep talking in English so everybody else could understand what I’m talking. Sometimes I get an error message with symbols etc. and in english, there’s a bit saying something like Voice 1 or Voice 3. How could I get Miku to sing English? & is there anyway I could get the songs into mp3 format? What about vowels? What’s the Phonetics for geting her to say A, E, I, O, U, & Y? Or is there not a way? Eh? How would this be done? & What is WAV? What can I use to convert it? Am I asking too may questions? Just wondering, if you want the vocaloids to do a cover of the song, and you have the instrumental, how do you import the instrumental/karaoke version of that song into the editor? And how do you switch the voices of people in a song? I used to know how, I believe it has something to do with the pencil tool and some menu on the editor…. thanks in advance! I'm having a horrible time trying to get my lyrics set. Spent a good amount of time with the User Dictionary, but still have to manually put in the phonetics, etc. I'm working with Rin and Len in the Vocaloid 2 program, and the only syllable that it will sing is "Ne" or the original ah. But I'm trying to use english lyrics. That might be part of the issue. I'm putting in phonetics for every one using the symbols from the User Dictionary, I've tried changing words etc, and all it likes so far is "a" and "ne". ..What on earth am I doing wrong? It's been…. beyond several hours now XD;;; Still lost. i tried doing this but it would ask for the phonetics and if i put the lyrics into there, miku would NOT sing. how do i fix this? hi, i'm still not understand which part of kitto. so if i want put a small tsu like "Datte", so i must write "Da", "tsu", and "te"? just forget i was even here. Oh I know this one! Some LIKES hatsune miku and also thinks she’s cute! wahaahaa I know simple japanese! Hello! I’m having trouble with my VOCALOID 3 cuz everytime i export a file to WAV and I’ll try to listen it in any media player, it plays but I hear nothing. any help with this? * Make sure “Master Track” is selected if you want all of your tracks included in the wav file. * Save the file somewhere. first check if your wav is 1+min when your song is not actually that long, skip to 7th second and there is your voice. adjust the Start and End before exporting to wav. Hi! Whenever I try to enter two syllables like ‘yami’ it will say ‘a’ instead of yami. What do I do? Please help. Okay, nevermind, I figured that out. But what about when you have a word like ‘tai’ I type in ‘tai’ and it says ‘a’. Did I do something wrong? You can install windows on your computer and make a shortcut to open windows as a window like program on your computer. When opened, it usually starts to run like when you turn your computer on and it’s really like you have another computer running at the same time, then you have both windows and whatever you had there. I’ve seen it myself in the past but I don’t know how to. Can you use original songs from artists on the vocaloid 3 editor. if so how do you do it. You have to type “fu” . In Japanese, there’s no such thing as “hu”. F and H had a love child and produced “fu”. Or you could type “hyu” . I think that one would best fit saying human. Hello…? I’ve been struggling with my Vocaloid 3. I have made a lovely tune with V3 English Miku, but when I go to Export, the WAV option is greyed out and I cannot click it. Can anyone help me? I just got VOCALOID 3, and am trying to make a cover for MCR’s Welcome To The Black Parade, but I’m having trouble with some of the lyrics, like “father” I’ve tried separating it, but it doesn’t work… plz help! Hello, I know this is a late comment but… I need help, I’ve recently bought KAITO V3 as my first ever Vocaloid. I sorta know what im doing, but I cant make him sing. I’ll put in a word out of the dictionary they have given me but right beside that word will be [a] and despite the other letters in the box, itll just say “a”. I think I had him say ‘i’, but it came out as “eee” someone please help. The A in the bracket are the phonetics. Phonetics are the way the vocaloid pronounce the words. There should be an option to switch the phonetics and the lyrics in the view section. The reason your notes are only coming out as “a” may be because the word your using isn’t comprehendable to the Vocaloid. Kaito V3 should have an english vb so try right clicking on the note screen and switching to Kaito english. In a japanese voice bank you basically only type things like “i” (which will sound like ee in a japanese VB), “Su”, “Ko”, and a lot more. In an english Vb it gets complicated, you basically use a BUNCH of phonetics to make them sound out the words. When you put “@” in the phonetics it makes an uh sounds (this is in the english VB only). Look up lots of tuning vocaloid tutorials and BE SURE to look up phonetics for english and japnese. I hope what I said makes sense. Hi! I need help on my vocaloid 4 editor and everytime I insert a note, it keeps overlapping even if I try moving it. If I DO TRY to move it, it would leave spaces. Can you help me? I think that’s a way. Reply if it does not work. Hey everyone! I’m having a little problem using my VOCALOID 3 because I can’t insert all the lyrics in a song. It always ends at SONG POS. 33:1:000 and I don’t know how to add them anymore. plz help! i can get miku to sing “s” without her saying u at the end ;-; how do i do that? That’s how su sounds,the s being s and u being M so you just need to delete the M in order to say s.
I’m using VOCALOID 4 and was wondering if there was a way to get Miku sound like she is just talking, not singing. I need help inserting wav files in vocaloid 4. I understand the measure and beat, but i need help with the “clock” part. I’m having issues with VOCALOID 4. I have the MEGPOID VoiceBank, and I tried typing a song, but all it did was cause the program to sing “aaa” for the duration of the song. I even made my own dictionary for it to use. But it still went “aaa.” Is there any known fix?